Moe, Curly and Larry, a.k.a. Bob, Donnie and me, spent the morning chill among the woods of Pennsylvania. My job was to walk about trying to move some deer past these two hunters. 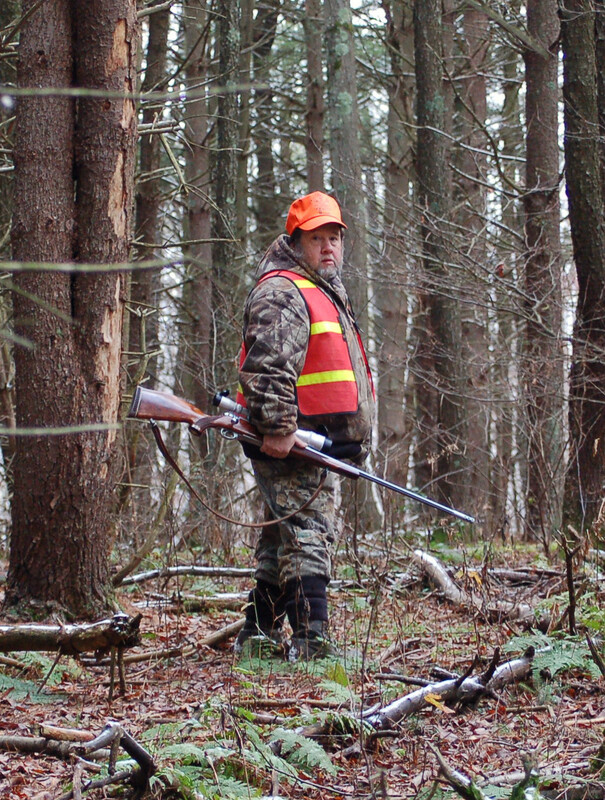 I have one deer tag left and I am waiting for after Christmas when the Pennsylvania primitive flintlock season begins. Everybody knows how I love to use the flintlock! 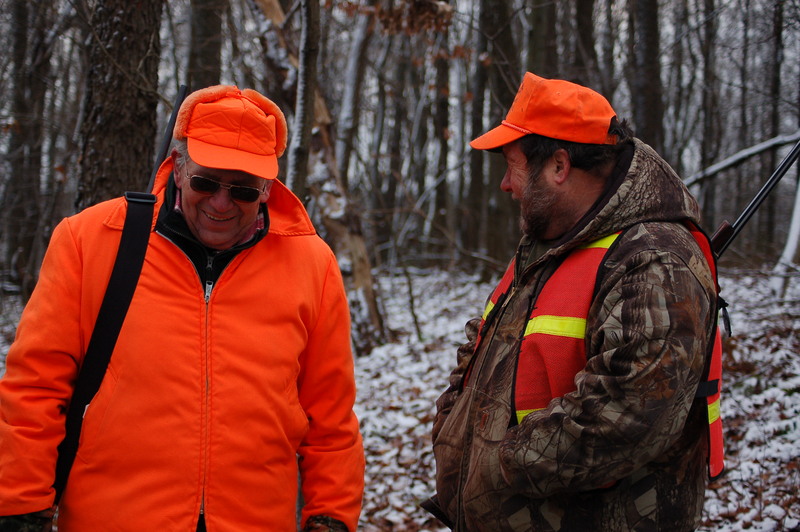 Neither Donnie (my cousin) nor Bob (my step-father) planned on shooting anything but buck or big does. A light snow helped to see contrast in many places. Donnie went into the woods about 6:45 since he was traveling deeper into the property. Bob and I were trekking several hundred yards and climbing a steep embankment to overlook a popular area. The hunt was to change course after a hour when I would begin sneaking around. I saw three deer at this site. 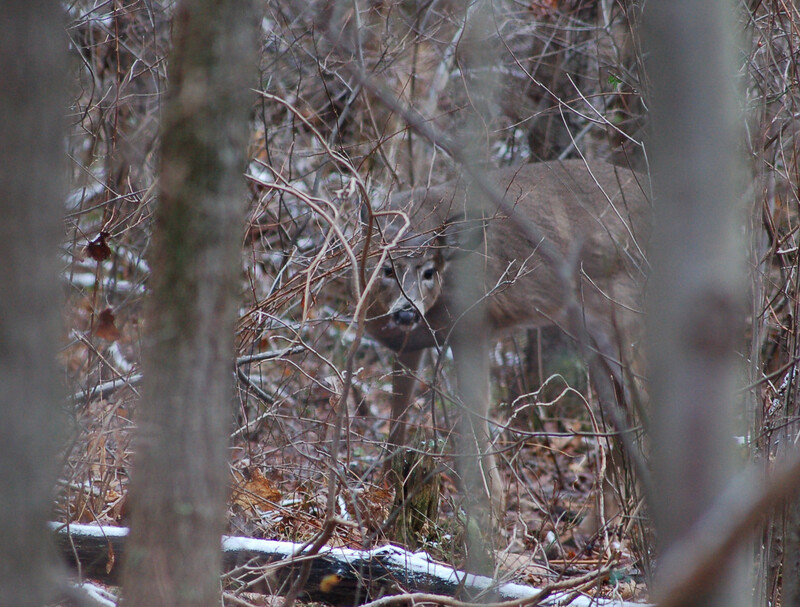 Later, I walked around Donnie and saw a doe standing about 35 yards from me. Stupid me clapped my hands instead of reaching for my camera that was still in my shoulder bag. I missed a great photo! On my last push before noon I spotted a deer laying about 65 yards out. I called Bob and told him to get ready. 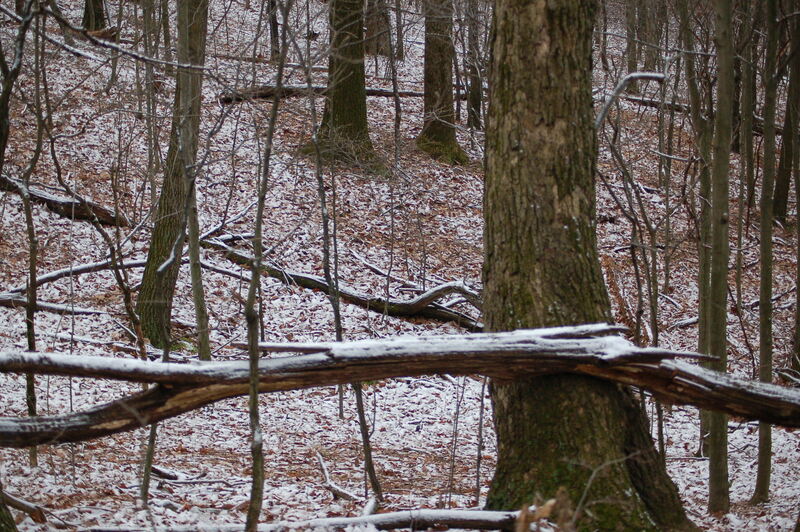 I walked towards the deer and this deer continually refused to walk out of this thick vine; tree top and briar area. I saw it several times only yards from me. Finally the deer broke and ran up towards Bob and apparently saw him for the deer turned and slowly ran behind me and returned to the very area she originated from. I crept up and had this deer about 20 yards from me. I managed one photo through the brush. 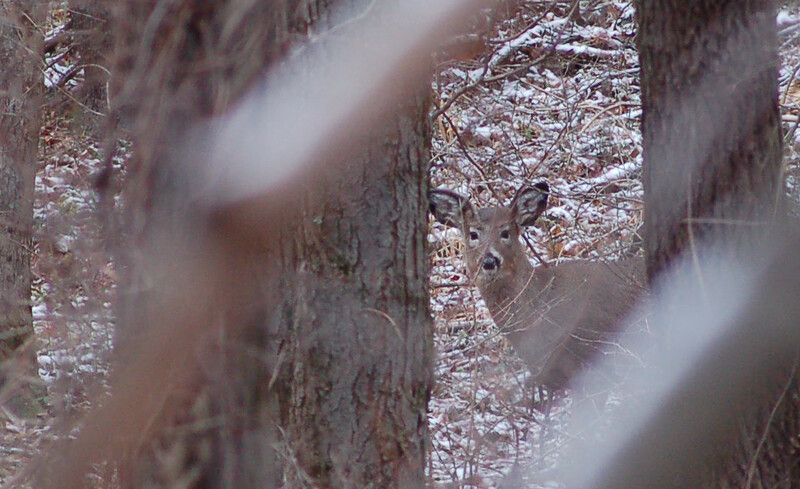 Later, Bob approached me and I saw this deer about 8 yards from me before she bolted. Bob said I will leave the deer for seed. After some carrying on the three of us walked back to the road and spent thirty minutes talking with a local landowner. I saw 10 deer and two grouse this morning. I enjoyed the fellowship of kinfolk too. Laughter is the norm when the three of us get together. I came home and laid down sometime after two and woke up at 5:20! The four hours of sleep the night before just didn’t cut it for an old man!